This report describes the historical development in the clinical application of chemical variables for the interpretation of acid-base disturbances. The pH concept was already introduced in 1909. Following World War II, disagreements concerning the definition of acids and bases occurred, and since then two strategies have been competing. Danish scientists in 1923 defined an acid as a substance able to give off a proton at a given pH, and a base as a substance that could bind a proton, whereas the North American Singer-Hasting school in 1948 defined acids as strong non-buffer anions and bases as non-buffer cations. As a consequence of this last definition, electrolyte disturbances were mixed up with real acid-base disorders and the variable, strong ion difference (SID), was introduced as a measure of non-respiratory acid-base disturbances. However, the SID concept is only an empirical approximation. In contrast, the Astrup/Siggaard-Andersen school of scientists, using computer strategies and the Acid-base Chart, has made diagnosis of acid-base disorders possible at a glance on the Chart, when the data are considered in context with the clinical development. Siggaard-Andersen introduced Base Excess (BE) or Standard Base Excess (SBE) in the extracellular fluid volume (ECF), extended to include the red cell volume (eECF), as a measure of metabolic acid-base disturbances and recently replaced it by the term Concentration of Titratable Hydrogen Ion (ctH). These two concepts (SBE and ctH) represent the same concentration difference, but with opposite signs. Three charts modified from the Siggaard-Andersen Acid-Base Chart are presented for use at low, medium and high altitudes of 2500 m, 3500 m, and 4000 m, respectively. In this context, the authors suggest the use of Titratable Hydrogen Ion concentration Difference (THID) in the extended extracellular fluid volume, finding it efficient and better than any other determination of the metabolic component in acid-base disturbances. The essential variable is the hydrogen ion. The purpose of this report is to describe the milestones of medical history within the area of hydrogen ion balance, and to discuss the validity of essential clinical variables for the interpretation of acid-base disorders and their application to high altitude. In 1909 SPL Sorensen (1868-1939) introduced the "pH" concept. He wrote in German: "das ich den Namen "Wasserstoffionenexponent" und die Bezeichnung pH für den numerischen Wert des exponenten dieser Potenz benütze". In his 173 pages long, excellent thesis (1) Sorensen used for the first time the buffer concept ("Puffer" - "welche im lebenden Organismus als natürliche Schutzwehr gegen zu schroffe Änderungen des Wasserstoffionenkoncentration dienen") and measured hydrogen ion concentration ([H+]) with "die genaue, aber umständliche, elektrometrische Methode". Sorensen (1) also used the acid/base concept, but Bronsted, first, in 1923 focused on the hydrogen ion in the definition of acids and bases. Bronsted (1879-1947) defined an acid as a substance able to give off a hydrogen ion at a given pH, and a base as a substance that could bind a hydrogen ion (Table 1). These definitions led to the concept of conjugate acid-base pairs. An ideal buffer pair ("Puffer") is a weak acid in equilibrium with its corresponding weak base. Table.1. The law of mass action, related equations (Eq) and reactions (Re). The [BB] is unchanged in acute, respiratory acid-base disturbances. **[ ] denotes concentration. Henderson (1878-1942) used the law of mass action for the dissociation of a weak acid and the salt formed with a strong base (Table 1, Eq 2). Bjerrum expressed the dissociation constant as a negative logarithm, which in 1917 allowed Hasselbalch (2) to convert Henderson´s equation to a logarithmic scale (Table 1, Eq 3). Van Slyke (1883-1971) introduced several gasometric methods, and is well known for the Van Slyke apparatus and a brilliant textbook written together with JP Peters (3). His equipment was mainly used to measure the total carbon dioxide concentration in blood [total CO2], and sometimes the pH with an electrometer. [Total CO2] is currently given in mM/L or mM. The partial pressure of CO2 (PCO2) is proportional to [dissolved CO2]. From the [total CO2] and pH we can calculate the 2 unknown variables [dissolved CO2] or PCO2 and [bicarbonate] with the use of equations 5 and 6 (Table 1). Van Slyke used these quantities (pH if available, PCO2 and [total CO2], the case history, and common sense to diagnose acid-base disturbances. In 1952-1953 the polio epidemic in Denmark increased dramatically the need for artificial ventilation and a reliable diagnosis of acid-base disturbances. Patients died in respiratory paresis with a high [bicarbonate] in their blood. The condition was interpreted as "alkalosis" with the laboratory terms used at that time. Bjorn Ibsen and Poul Astrup proved the "alkalosis" hypothesis to be a misinterpretation. Through the help of electrometric pH determinations the condition was shown to be carbon dioxide retention with massive respiratory acidosis. The patients were given artificial ventilation and survived. Before this insight was obtained, the high actual bicarbonate concentration was obviously misleading, since it was the consequence rather than the cause. Poul Astrup´s group of scientists therefore developed methods to distinguish respiratory from non-respiratory acid-base disturbances (4, 5, 6). Siggaard-Andersen had joined the group and in 1960 they produced a micro method for the determination of pH, carbon dioxide tension, and base excess (BE) in capillary blood (7). Here, BE different from zero in whole blood was proposed as an index of metabolic acid-base disturbances. Two years later Siggaard-Andersen published his work on experimental acid-base disturbances in dogs (8), his alignment nomogram (9) followed and then his dissertation describing the acid-base status of blood and of the whole organism (10). However, he had already considered the importance of standard base excess (SBE) in the extended extracellular fluid volume (eECF), and he also introduced the term 'concentration of titratable hydrogen ion' as an alternative to SBE. The SBE is equal to the actual BB minus normal BB (Table 1). The 'titratable hydrogen ion concentration difference' can be shortened: 'Titratable Hydrogen Ion Difference' or THID, which is equal to SBE but with opposite sign. The variables used in that dissertation were accepted as a rational choice, but the concept of 'base excess in whole blood' was criticized. In their criticism Schwartz and Relman (11) concluded "that the traditional measurements of pH, PCO2 and plasma bicarbonate continue to be the most reliable biochemical guides in the analysis of acid-base disturbances" - and - "allow rational evaluation of even the most complicated acid-base disorders." Let us see whether these statements hold true. In reality, SBE and THID represent the same concentration difference from normal in mM but with opposite signs. Hence, from now on THID is used instead of SBE. This value in normal subjects is equal to 0, positive in primary (bicarbonate treatable) metabolic acidosis and negative in primary metabolic alkalosis. SBE is discharged, since the essential variable is not a base and in reality is not always an excess (ie, excess or deficit). The body tends to maintain a pH of around 7.40 in the extracellular fluid volume by respiratory excretion of carbon dioxide and renal excretion of non-carbonic (non-volatile) acid or base. During light activity the oxidative metabolism produces up to 1 M of CO2 per hour that is eliminated by the lungs at the same rate. Hereby, the alveolar fraction and tension of CO2 is maintained at around 5.33 kPa (40 mmHg) at sea level. Hepatic production of hydrogen ions depends upon its daily amino acid load from intestinal absorption. Persons on a normal mixed diet produce up to 100 mM of H+ daily in the liver by oxidation of sulphydryl groups in amino acids and hydrolysis of phosphate esters from lipids. Of these 100 mM H+ daily, 70 mM are typically excreted in 24 h urine. The remaining 30 mM of metabolic H+ is eliminated by oxidation of 30 mM organic bases from the gut (RCOO-). Amino acids are oxidized into CO2 and water. The amino nitrogen is liberated as ammonia (NH3). One ammonia molecule combines in the liver with 2 carbon dioxide molecules to form one urea molecule via the Krebs urea cycle, so normally the hepatic ammonia production eliminates itself. One mol of nitrogen daily can produce 500 mM of urea, which is equal to the typical urinary urea excretion. Alkalosis stimulates urea production. The daily urea filtration flux is 900 mM (5 mM x 180 L of plasma each day). The degree of reabsorption of the water-soluble urea depends upon the tubular flow rate. In the kidneys, there is ammonia production from glutamine, a non-toxic ammonia store. One molecule of NH4+ is produced by deamination of one glutamine molecule by the enzyme glutaminase, and a second by oxidative deamination of glutamic acid forming alpha-ketoglutarate that is metabolized. The NH4+ in the proximal tubule cells is in equilibrium with minimal amounts of NH3 at the relatively low pH. The NH4+ secretion into the tubular fluid makes use of the Na+-H+ antiporter, where NH4+ substitutes H+. The NH4+ passes with the tubular fluid to the thick ascending limb of the Henle loop, where a major portion is reabsorbed and accumulated in the interstitial fluid. Ammonia diffuses easily into the urine and binds to a hydrogen ion to form NH4+. About 30 mM of NH4+ is excreted in the normal daily urine, but the excretion is controlled during acid-base disorders. During acidosis, the high [H+] stimulates hepatic glutamate and renal NH4+ production, and the renal NH4+ excretion increases towards 400 mM daily. During alkalosis, the urea production accounts for the nitrogen elimination and only negligible amounts of NH4+ are excreted. Normally, the daily filtration flux of bicarbonate amounts to 4500 mM (ie, filtration of 180 L of plasma with a mean concentration of 25 mM). Most of the filtered bicarbonate flux is reabsorbed already in the proximal tubules, where the luminal membrane contains a Na+-H+-antiporter. The bicarbonate reabsorption is accomplished by means of H+-secretion. Most of the H+ secreted in the proximal tubules is derived from the Na+-H+ exchange through the antiporter. When the tubular fluid reaches the collecting ducts an important H+ secretion is mediated by a proton-K+ ATPase in the intercalated cells. Acidosis, which involves the intracellular space and stimulates production of proton-K+ ATPase, also favors H+ secretion. Hereby, bicarbonate reabsorption is stimulated, whereas alkalosis inhibits bicarbonate reabsorption by the opposite mechanisms. This section describes both the Acid-Base Chart and the Strong Ion Difference. In 1971 Siggaard-Andersen published his widely used acid-base chart (12). Blood plus interstitial fluid function as one compartment (eECF). Carbon dioxide diffuses easily through the red cell membrane, so eECF functions as the primary distribution volume for H+ changes. In his latest publication (13) the BE scale has been altered to a titratable hydrogen ion concentration scale. The eECF is important, because the whole purpose for our homeostatic acid-base balance is to protect the cellular content against consequential alterations of H+ derived from the extracellular environment. The titratable hydrogen ion concentration or BE of this eECF is shown in the chart (Fig. 1). Fig. 1. The Acid-base Chart was copied with permission from Radiometer Copenhagen A/S (copyright). Thus, y is a linear function of x, and the slope of the line is -1 (- 45°). This is called an iso-bicarbonate line, and the slope reflects the buffer capacity (rise in carbonic acid per pH unit) of the bicarbonate buffer in plasma-water. 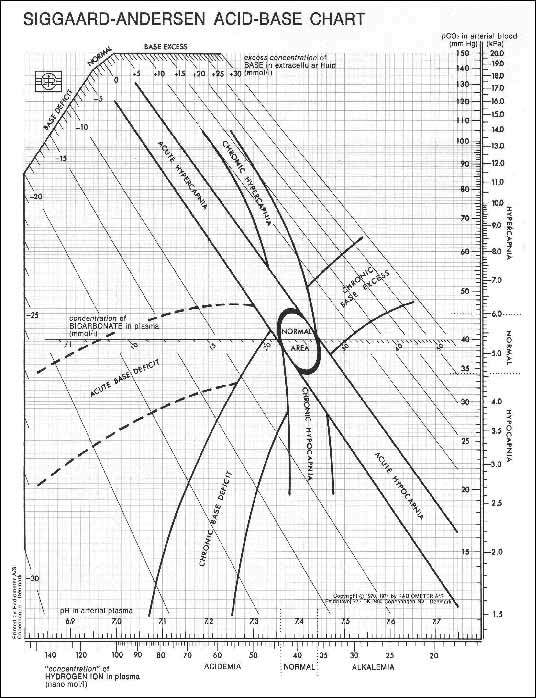 Iso-bicarbonate lines are indicated with small -1 divisions on an abscissa axis located at 5.3 kPa (40 mmHg) on the ordinate at sea level. 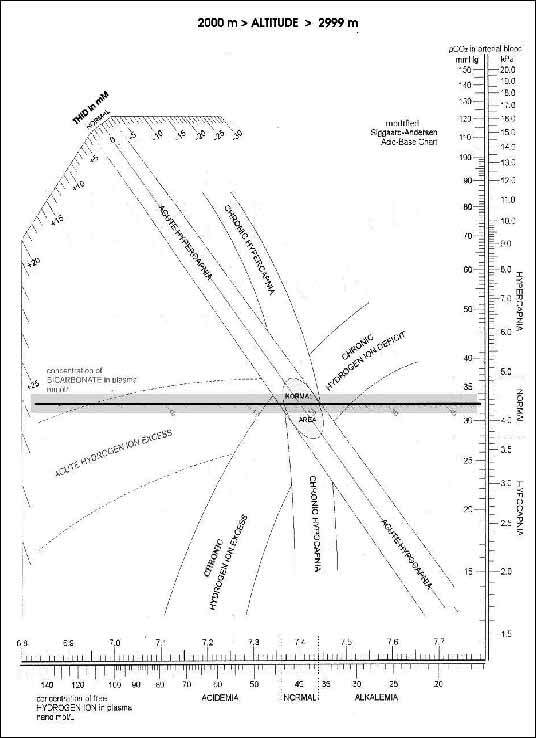 By analogy, the slanting lines on the Chart we would call iso-THID lines. They project to the scale on the upper left corner. These iso-lines are steeper than -1, illustrating the expected larger buffer capacity of the eECF compared to bicarbonate buffer only. The slope depends mainly of the hemoglobin concentration, which in the eECF is 3 mM (9.18/3) at sea level. It is noteworthy that each point on the chart can be reached in several ways. The case history, not the acid-base variables, is the only source to the actual sequence of events. Before and after Siggaard-Andersen´s dissertation, other coordinate systems have been introduced. Early on, Van Slyke proposed the use of the pH bicarbonate system, which was adapted by Davenport in his widely used textbook (14). The Davenport diagram depicts pH as the abscissa and bicarbonate concentration as the ordinate. In this diagram, the iso-PCO2-lines are exponential curves. Others (15) have constructed standard log bicarbonate (ordinate) - pH nomogram, where the iso-PCO2 lines obtained are straight (a modification of Eq 7, Table 1, where y is equal to or approximately equal to x + k). In Europe, none of the many coordinate systems proposed are as widely used as the acid-base chart (Fig. 1) along with its related computer strategies. The titratable hydrogen ion concentration difference (THID) is ideally determined by titration to a pH of 7.40 at a PCO2 of 5.33 kPa (40 mmHg) at sea level, oxygen saturated and at a blood temperature of 37°C (Fig .1). where [HCO3-] = [actual bicarbonate] - 24.5 mM, for a hemoglobin concentration of 3 mM in eECF. The factors 0.93 and 14.6 depend upon the hemoglobin concentration (12). The THID in vivo is independent of PaCO2, since any change in PaCO2 implies opposite molar changes of the bicarbonate and the non-carbonic buffer concentrations. Hereby, there is no change in THID so the value is constant (normally equal to zero) during acute changes in PaCO2 by hyper- or hypoventilation. The buffer capacity of the carbon dioxide - bicarbonate buffer is high, since respiratory elimination of CO2 and bicarbonate excretion by the kidneys rapidly maintains PaCO2. Even before Bronsted defined acids and bases in 1923, these concepts were used in technical and biological sciences and their rational use has continued ever since. However, a drawback occurred in 1948, when Singer and Hastings (17) reintroduced the old Chinese definitions of acids and bases. They consequently defined the buffer base concentration in plasma as the sum of strong non-buffer cations ('bases') minus the sum of non-buffer anions ('acids'). Such definitions were widely accepted in the medical world. Schwartz and Relman (11) recommended already in 1963 the use of the actual plasma bicarbonate concentration in the evaluation of acid-base disorders. A change in the bicarbonate concentration does not reflect the total alteration of non-volatile acid or base, and the bicarbonate concentration depends upon the PCO2. The actual bicarbonate concentration thus disqualifies as an essential variable. According to the law of mass action the dissociation constant for water (K'w) is defined by: K'w = [H+] [OH-])/[H2O]. The dissociation constant is temperature-dependent and of the order of 10-14 M/kg - as measured long ago (1; p. 302). The molality for water is high (1000/18 = 55.56 M/kg) and its size essentially unaffected by the small dissociation, so (K'w x [H2O]) is equal to a new constant, K'w. Since pure water is electrically neutral, the [H+] = [OH-] and [H+]2 = K'w; the hydrogen ion activity equals the square root of the new constant in pure water. Sound considerations like these lead to the application of a similar line of reasoning and algebra to strong ion solutions and to complex body fluids (18). In complex body fluids SID was defined as the sum of all strong cation concentrations ('bases') minus the sum of all strong anion concentrations ('acids'), just like the definition of buffer base (17). However, SID does not measure the essential variable, THID, and thereby disqualifies. Stewart´s SID approximation (18) was reintroduced (19). Soon after, the misleading use of the SID concept was pointed out (16, 20). An analysis of the Stewart model (21) concludes that SID offers no quantitative advantage over BE in whole blood. However, the analysis overlooks the advantages of THID - not in blood - but in the eECF. THID in eECF is independent of PaCO2 in vivo and independent of the hemoglobin concentration within normal limits. It provides enough information to calculate directly the need for immediate treatment of metabolic acidosis. The amount of bicarbonate in mM given intravenously can sometimes be calculated by multiplying the THID (in mM) times 20% of the body weight in kg or liters. THID in eECF remains equal to zero during acute alterations of PaCO2, such that these are purely of respiratory origin. THID in eECF, together with the case details, tells the total metabolic story, and not part of it as most of the older concepts do. All that makes THID the diagnostic choice. Humans can suffer from four acid-base disorders: respiratory acidosis, respiratory alkalosis, metabolic acidosis, and metabolic alkalosis. The four primary or acute acid-base disturbances, and their four compensated or chronic types, constitute, together with the normal condition, the nine van Slyke conditions. Plotting the measured pH and PCO2 in the acid-base chart allows estimation of the BE or THID, and combined with the case history, as an absolute requisite, the correct diagnosis can be reached (Fig.1). Acidosis is defined as a disorder with pH in the arterial blood (pHa) less than 7.38, and alkalosis as a condition with a pHa larger than 7.44 for females (7.37- 7.43 for males). Respiratory acid-base disorders cause primarily acute changes of PCO2, leading to acute changes of pH, whereas THID in eECF is maintained around zero. Secondarily, the acute changes are more or less compensated by altered renal excretion of acid or base in a matter of days, so pH tends to be normalized. Metabolic acid-base disorders cause primary changes in BE or THID in eECF. Secondarily, these changes are partially compensated by the lungs in a matter of hours. The final correction of metabolic disorders is typically renal and takes days. Respiratory alkalosis is caused by ventilation that is disproportionately high compared to CO2 production, whereby PaCO2 falls and pH increases (acute hypocapnia, in Fig. 1). As the PIO2 falls with increasing altitude in normal subjects, PaO2 eventually falls below the ventilation threshold 55 mmHg, which stimulates the chemoreceptors to induce hyperventilation (CO2 washout). Hyperventilation is a typical reaction to high altitude. It is estimated that over 110 million people live at altitudes above 2500 m, around the world (Table 2). Tourism and mountain sports are on the rise, thereby extending this number by several million per year. Intensive care units are increasing in numbers as the population growth demands. It is essential that the attending physicians have precise guidelines for treatment of acid-base disorders at high altitude. This critical life-saving procedure has up to now been overlooked. Table.2. Altitudes and populations of different cities and towns around the world. Acute respiratory alkalosis is compensated by increased renal excretion of bicarbonate, which is the result of decreased tubular H+ secretion. This is because the low PaCO2 reduces the tubular H+ secretion, and alkalosis inhibits formation and secretion of NH4+. After a few days, renal compensation of the respiratory alkalosis is complete, and pH is back to normal. This is called totally compensated respiratory alkalosis or chronic hypocapnia (Fig.1). If for example, Siggaard-Andersen's Acid-Base chart is used at the altitude of La Paz, where PaCO2 normally is 30 mmHg, the correction of metabolic acidosis is made to sea level values. Yet they should, in reality, be made to a +5 mM in SBE or -5 mM as THID. This applies both to permanent residents and to newcomers. Statistical analysis was performed on arterial blood samples from 1865 persons, breathing ambient air analyzed at the High Altitude Pathology Institute in La Paz at 3510 m with a Radiometer pHMK2. These included ambulant and hospital patients, both male and female, of all ages. The mean PaCO2 was 29.4 ±0.16 mmHg, which, presumably due to inclusion of hyperventilating sea level newcomers, was slightly below the normal value of 30 mmHg in La Paz. The mean pH was 7.4 ±0.005, which is identical to the normal value at any altitude. From these two values, THID (or SBE) in the eECF was calculated by means of the Van Slyke sea level equation to be -5 (or 5 mM). The normal area, therefore, for an average of 3600 m (ie, La Paz and Lhasa) on the sea level Siggaard-Andersen Chart is shifted down into the chronic hypocapnia zone. From the high altitude point of view this is not chronic hypocapnia but rather normal values (22), so all the 9 Van Slyke conditions have to migrate with the normal area. Consequently, acid-base charts have been developed for three different altitudes to aid clinicians at the sites of high altitude residence, exemplified in Table 2. Although altitude shifts within the same city give rise to significant acid-base changes, as for example in La Paz (23), the average altitudes were given for each city in Table 2. Furthermore, there is a considerable variation in normal values found at similar altitudes around the world in different populations, so in order to simplify the charts an acceptable range (shaded area) is included for each altitude, calculated from the bibliographic data (21, 24, 25). The calculated mean altitude HCO3- values for the chosen altitudes (2500 m, 3500 m, and 4500 m) are 19.8, 18 and 16.2 mM, respectively. Additionally the buffering capacity of a normally increased hemoglobin concentration at high altitude must be taken into account in order to be precise. The first term in the Van Slyke equation ([Hb] factor 1) is calculated based on the data from our laboratory: [Altitude Hb] = [Hb] + 0.2 x (altitude in km), which results in 0.92, 0.91 and 0.91 at the three altitudes, respectively. The buffer value of non-bicarbonate buffers in blood (ßB) is calculated using these altitude Hb values and the formula: ßB = 2.3 x [Hb] + 7.7 mM being 15.8, 16.2, and 16.7 mM at the 3 altitudes, respectively. Furthermore, one fundamental observation that is borne from this analysis is that the much lower bicarbonate buffer concentration at high altitude minimizes its buffer capacity, whereas the non-bicarbonate buffer capacity increases somewhat. [Altitude Hb] = [Hb] + (2.25 - 0.003 x (PB in mmHg)). where [HCO3-] = [actual bicarbonate] - 24.5 mM. where [HCO3-] = [actual bicarbonate] - 18.0 mM. where [HCO3-] = [actual bicarbonate] - 16.2 mM. Again, note that the THID is the old SBE with a reversed sign. The normal area for pH is maintained for all three altitudes at 7.4 ±0.04. This further stresses the point of view that it is not the anion or cation changes that are important, but rather the pH balance that is crucial also at high altitude. Actual on-site high altitude hydrogen ion titrations are required in the near future repeating those originally carried out by Siggaard-Andersen. THID is transcendental and life saving for the high altitude residents and the newcomers alike. The immediate strategy upon arrival to a given altitude is to help the body adapt. Most problems arise within 48 h following arrival, where the acid-base balance is changing. Therefore, when therapy is required in an intensive care unit during this period, it should point to correcting the acid-base imbalance of newcomers to that of a normal, well adapted resident (Fig. 2). Fig. 2. 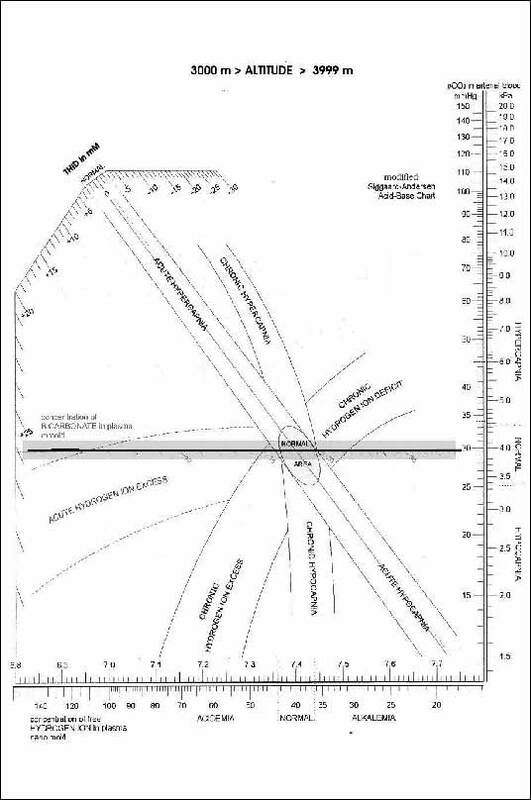 The Siggaard-Andersen acid-base chart modified for altitudes 2000-2999, 3000-3999, and 4000-4999 m above sea level. The shadowed area provides margins to variations in normal values at different locations around the world. Titratable Hydrogen Ion concentration, a deviation from normal in extended extracellular fluid volume, is abbreviated as THID. New technology increases the need for an easy interpretation of laboratory data. As shown above, the acid-base chart and the related computer strategies make the diagnosis of acid-base disorders easy at a glance. Further developments and supplements of the chart were performed with the oxygen status algorithm (26) and recently with a new PO2 - PCO2 diagram (27). Such diagrams ought to be included in all medical textbooks and in internationally standardized laboratory journals. Altitude specific charts are included for 2500 m, 3500 m, and 4500 m and the altitude correction factors are included in the Van Slyke equation. This is of fundamental use for ever growing high altitude populations around the world, high altitude tourism and mountain sports, allowing adequate and precise correction of the acid-base disorders. The THID in the extended extracellular fluid volume is efficient and theoretically better than any other determination of the metabolic component in acid-base disturbances even at high altitude. Acknowledgements: We acknowledge the assistance of Professors Gustavo Zubieta-Castillo, Joop Madsen, Simon Rune, and Ole Siggaard-Andersen for contributions and of Kirsten McCord with the final electronic format. Sorensen SPL. Enzym studien. II. Mitteilung. Über die Messung und die Bedeutung der Wasserstoffenkonzentration bei enzymatischen Prozessen. Biochem Z 1909; 21: 131-304. Hasselbalch KA. Die Berechnung der Wasserstoffzahle des Blutes aus der freien und gebundenen kohlensaure desselben und die Saurstoffbindung des Blutes als Funktion des Wasserstoffzahl. Biochem Z 1917; 78: 112-144. Peters JP, Van Slyke DD. Quantitative Clinical Chemistry. I. Interpretations. London, Baltimore, Williams & Wilkins, 1931. Astrup P, Jorgensen K, Siggaard-Andersen O, Engel K. The acid-base metabolism. A new approach. Lancet 1960; 1: 1035-1039. Astrup P, Schroder S. Apparatus for anaerobic determination of pH in blood. Scand J Clin Lab Invest 1956; 8: 30-32. Jorgensen K, Astrup P. Standard bicarbonate, its clinical significance and a new method for its determination. Scand J Clin Lab Invest 1957; 9: 122-128. Siggaard-Andersen O, Engel K, Jorgensen K, Astrup P. A micro method for determination of pH, carbon dioxide tension, base excess, and standard bicarbonate in capillary blood. Scand J Clin Lab Invest 1960; 12: 172-176. Siggaard-Andersen O. Acute experimental acid-base disturbances in dogs. An investigation of the acid-base and electrolyte content of blood and urine. Scand J Clin Lab Invest 1962; 14: 66. Siggaard-Andersen O. 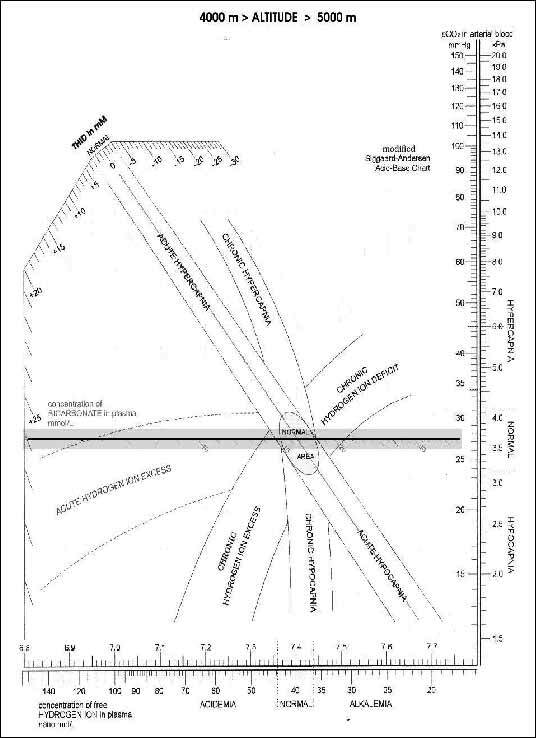 Blood acid-base alignment nomogram. Scales for pH, PCO2, base excess of whole blood of different hemoglobin concentrations, plasma bicarbonate, and plasma- total-CO2. Scand J Clin Lab Invest 1963; 15: 211-217. Siggaard-Andersen O. The Acid-Base Status of the Blood. Scand J Clin Lab Invest 1967; 15: 70, 1-134. Schwartz WB and Relman AS. A critique of the parameters used in evaluation of acid-base disorders. N England J Med 1963; 268: 1382-1388. Siggaard-Andersen O. An acid-base chart for arterial blood with normal and pathophysiological reference areas. Scand J Clin Lab Invest 1971; 27: 239-245. Siggaard-Andersen O. Acid- Base Balance. Encyclopedia of respiratory medicine, 2004; 1-5. Davenport HW. The ABC of acid-base-chemistry. The elements of physiological blood-gas-chemistry for medical students and physicians. 4 Ed. Chicago, 1958. Bjeldager PA, Christiansen E, Jensen HA, Paulev PE. Improved effect of hemodialysis on acidemic patients from an acetate concentration of 38 mmol/l. Nephron 1981; 27: 142-145. Siggaard-Andersen O, Fogh-Andersen N. Base excess or buffer base (strong ion difference) as measure of a non-respiratory acid-base disturbance. Acta Anaesthesiol Scand Suppl 1995; 107: 123-128. Singer RB, Hastings AB. An improved clinical method for the estimation of disturbances of the acid-base balance of human blood. Medicine (Baltimore) 1948; 27: 223-242. Stewart PA. Modern quantitative acid-base chemistry. Can J Physiol Pharmacol 1983;61:1444-1461. Fencl V, Leith DE. Stewart's quantitative acid-base chemistry: applications in biology and medicine. Respir Physiol 1993; 91: 1-16. Siggaard-Andersen O, Gothgen IH. Oxygen and acid-base parameters of arterial and mixed venous blood, relevant versus redundant. Acta Anaesthesiol Scand Suppl 1995; 107: 21-27. Wooten EW. Science Review: Quantitative acid-base physiology using the Stewart model. Crit Care 2004 8: 448-452. Zubieta-Castillo G, Zubieta-Calleja GR, Arano E, Zubieta-Calleja L. Respiratory Disease, chronic mountain sickness and gender differences at high altitude. In Progress in Mountain Medicine and High Altitude Physiology, H Ohno, T Kobayashi, S Masuyama, M Nakashima (eds). Matsumoto, Japan, 1998, pp.132-137. Triplett JC, Zubieta-Calleja L, Zubieta-Castillo G, Zubieta-Calleja GR Physiological changes related to rapid altitude shifts - La Paz. Acta Andina 1996; 5: 19-21. Gonzalez-Garcia M, Barrero M, Maldonado D. Exercise limitation in patients with chronic obstructive pulmonary disease at the altitude of Bogota (2640 m). Breathing pattern and arterial gases at rest and peak exercise. Arch Bronconeumol 2004; 40: 54-61. Perez P, Jr, Vazquez Garcia JC. Estimation of gasometric values at different altitudes above sea level in Mexico. Rev Invest Clin 2000; 52: 148-155. Siggaard-Andersen M, Siggaard-Andersen O. Oxygen status algorithm, version 3, with some applications. Acta Anaesthesiol Scand Suppl 1995; 107: 13-20. Paulev PE, Siggaard-Andersen O. Clinical application of the pO2-pCO2 diagram. Acta Anaesthesiol Scand 2004; 48: 1105-1114. Author’s address: P-E. Paulev, Institute of Medical Physiology, The Panum Institute, University of Copenhagen, 3 Blegdamsvej St., 2200 Copenhagen N, Denmark; phone +44 35 327413.